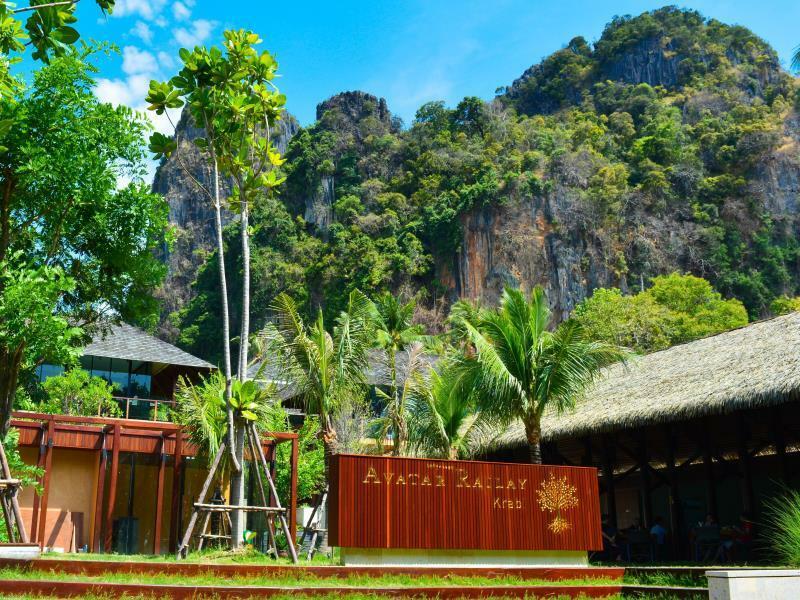 Ada pertanyaan untuk Avatar Railay Resort? Dibangun pada 2011, Avatar Railay Resort adalah pelengkap yang nyata di Krabi dan pilihan yang cerdas bagi para wisatawan. Hotel ini terletak 15 km dari pusat kota dan menyediakan kemudahan akses ke fasilitas-fasilitas penting kota ini. Dengan lokasinya yang strategis, hotel ini menawarkan akses mudah ke destinasi yang wajib dikunjungi di kota ini. Di Avatar Railay Resort, pelayanan istimewa dan fasilitas yang unggul akan membuat pengalaman menginap Anda tidak terlupakan. Fasilitas terbaik hotel ini termasuk WiFi gratis di semua kamar, layanan kebersihan harian, check-in/check-out cepat, penyimpanan barang, Wi-fi di tempat umum. Akomodasi hotel telah dipilih secara cermat demi kenyamanan maksimal dengan adanya televisi layar datar, kopi instan gratis, teh gratis, minuman selamat datang gratis, pintu masuk pribadi di beberapa kamar. Kolam renang luar ruangan, taman di hotel ini adalah tempat-tempat ideal untuk bersantai setelah hari yang sibuk. Apapun alasan Anda mengunjungi Krabi, Avatar Railay Resort adalah tempat yang sempurna untuk liburan yang menyenangkan. We had such a lovely stay at the Avatar, the staff we friendly and the facilities were excellent. Right from the very moment we checked in, we felt relaxed and happy. Would highly recommend and will definitely be returning...we didn't want to leave! My boyfriend and I stayed here for 3 nights, and it was by far our favorite hotel we stayed at in Thailand. Amazing room with pool access, friendly staff and a good breakfast/restaurant. Loved the ambiance! Perfect location for walking everywhere. We love the hotel itself, including the room and pool. Staff was meh. Not overly nice and very slow when a drink or food was ordered. Would stay again and just eat elsewhere. The location you cant beat. I loved my stay at Avatar Railay. great value! I would recommend shelling out a little extra cash for a villa! they are lovely! The pool entrance rooms are cool however the pool gets no sun and can be pretty chilly. didn't see many people actually in there! You will definitely get some monkey visitors so make sure you keep balcony doors locked and keep your belongings inside! Our stay at Avatar was absolutely exceptional. The resort is very nice, clean and even if the location is not on the beach, you can easily get there. Staff was very kind and the food from the restaurant was very good. I can not say enough nice things about the staff and the facility at Avatar Railay Resort. We were upgraded from a deluxe room to a villa, and is was MAGNIFICENT!!! Very clean, and well decorated, the shower was better than mine at home. The staff was very nice and cordial during our stay, and the breakfast was AMAZING every day, lots of delicious options. I really enjoy staying here the room was very spacious and it was really. Most of the rooms have a pool and a balcony I especially love the balcony it has a cute sitting area with pillows. I enjoy sitting on it and drinking my afternoon coffee. The bed was SUPER COMFY, haven't had a comfy bed for the month we traveled in thailand, so that was a nice surprise. The pool/area is very nice, next to the pool they have a "relaxed room" inside was just chairs and table and computers you can use for free including the printers. Breakfast was really good!!! Me and my boyfriend loves it. Some people say it was ok and didn't have a lot of varieties but I didn't think that at all they had a lot. AND its really YUMMMY! Overall Everything was excellent I would totally recommend this resort to my friends and would totally come back here again. Facilities were great, everything you'd expect in a resort. Lovely pool, balcony is huge for just chilling and reading. Free internet, great room service - and on a totally isolated part of Thailand. No cars here, since the area is locked in by mountains. In by boat, out by boat. Simply superb. We had to stay an extra night on Railay due to Storm Pabuk and our previous hotel could not accommodate us so we booked one night at the Avatar through Agoda at 9.30am. We went along about 11.45am and to our surprise our room was available and we were aloud access. Staff were very pleasant, totally opposite from our previous hotel. Room had pool access and was very well equipped, for our one night stay, even had a mosquito plug in machine! Only minus point was room was slightly dark. Had an enjoyable stay and wouldn’t hesitate to return. The hotel is located in the east side, very close to the floating pier. The room was spacious and always clean by the staff. The only thing they could improve is the electrical outlets that are far from the bed. The pool is amazing. The breakfast is tasty and they have happy hour everyday with live music. The staff is fantastic. For what you pay, this resort is totally recommended. We got the room with pool access which was very convenient. 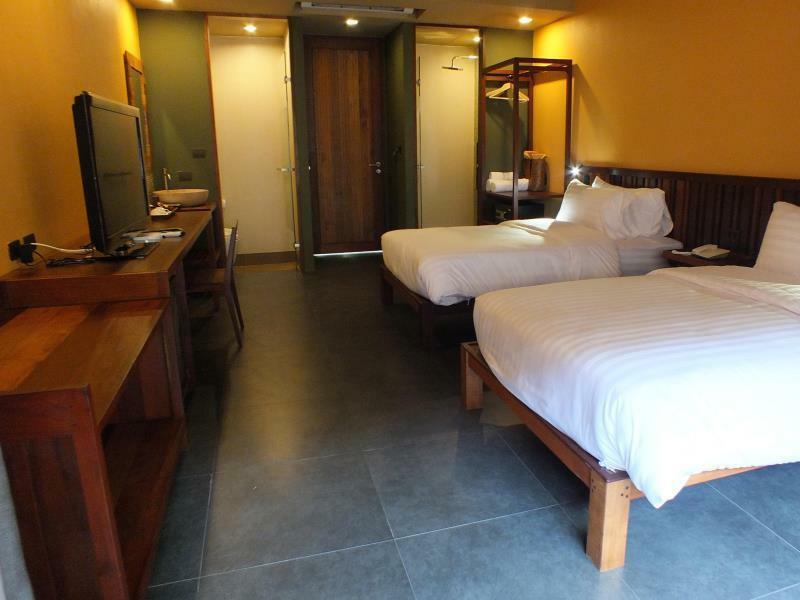 The room is big, the bed and shower are great! The hotel is cute, clean and tidy.The Garden and pool are very well mantained. We stayed at Avatar between Christmas and new year, and there were live shows and performances every night. The breakfast was just ok. Nothing special. We had to check-out at 12:00 but the staff allowed us to use the shower/soap/toilet from the swimming pool even after we had checked out, and this was a gesture we really apprecciated. We would definetely stay at Avatar again! The hotel and facilities are very nice, if you are happy with not having exceptional privacy (the accommodation blocks face each other so you can see into the rooms across the other side of the pool). The location was very good - on the east side of Railay therefore close to the bars and restaurants and also close to the pier. The most disappointing thing for us was there not being a luggage transfer service from either the east (pier) or west side (beach drop off) of Railay. We got dropped off on the beach in west railay and with elderly relatives and a baby in tow found it difficult and 'stressful' to navigate from the west side to the east side even though we had actually visited Railay before. It turned out we could have taken a more easy concrete path rather than a mud track but it was still a 15 minute or so walk with heavy luggage. This is very disappointed and we would have happily paid for the service, if it were offered. Also one young boy staff who was cooking eggs for breakfast was always on his phone and we had the feeling to bothered him asking him a dish to cook . And it is not very hygiénique too to touch the food after taping on his mobile . . 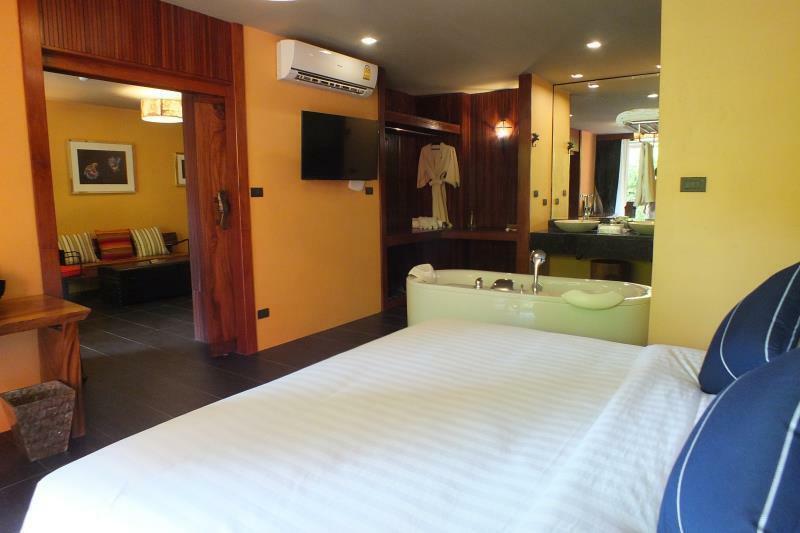 The room is spacious with a nice bathtub inside the room. However, the cleanliness of the room can be further improved. The toilet had a strange smell and there was a coffee stain on the table. The front desk is managed by 1 staff who has to show guests to their rooms. So it does take a while to wait for the staff to return if he/she is out to send some guests. I bounced around to a few hotels/bungalows in Railay and this was by far my favorite. I even extended my trip to keep staying here. 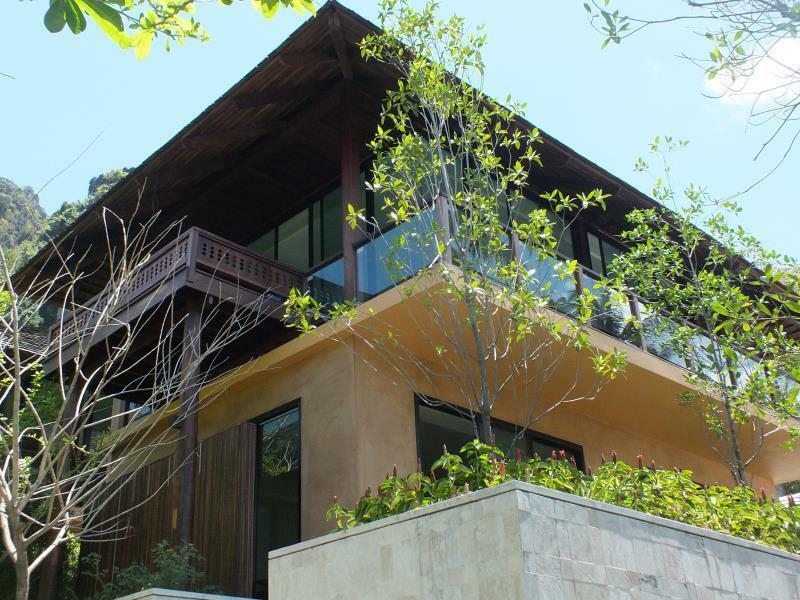 I was in one of the villas, which was an incredible value. The pool is also one of the best I saw in Railay. Breakfast was pretty decent, not the best. But I highly recommend this place. PS, it really doesn't matter what side of Railay you stay on (West vs. East) -- You get get anywhere in Railay in a 3-minute walk. This is a good place to stay for a relaxing getaway. I stayed in a Villa Room, which was spacious and nicely decorated - wood panelled walls, a bath, nice balcony with a built in wooden daybed. The resort is well designed with a beautiful pool that's long enough to do laps in if you wanted. Nice touches were a basket with two beach towels in the room, a folding laundry line on the balcony, and powerful gooseneck reading lights above the bed. The onsite restaurant serves tasty food at reasonable prices, though I wasn't keen on the constantly playing selection of pop music videos. I highly recommend staying here. Breakfast was decent. The room was clean and comfortable. 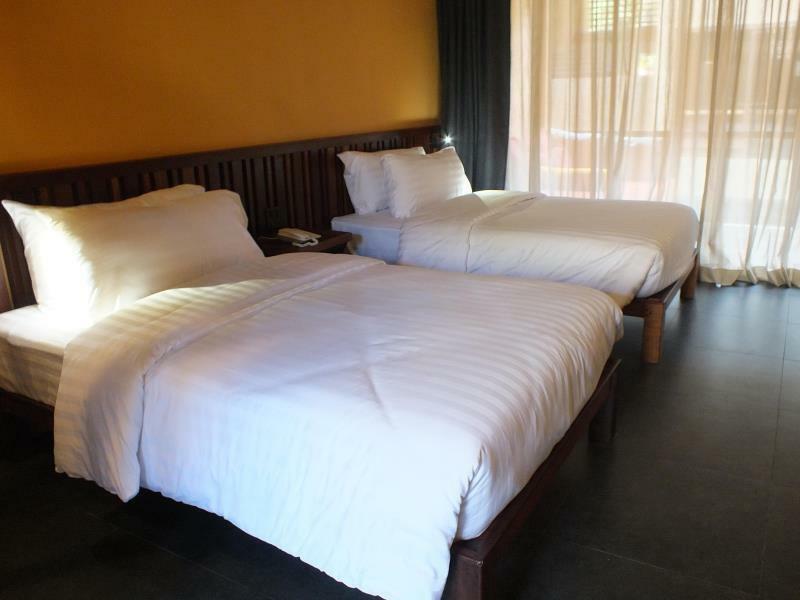 Room safe, a/c, Bath robes, and so much more to ensure that you are able to relax and enjoy your time on Railay with Avatar. Popular spot to watch big sporting events but the food and drinks are a bit pricey. Not to worry, it's all still very affordable and there are lots of alternative places to eat or purchase refreshments. I enjoyed it, booked an extra night, swam in the pool, lounged on the balcony and would definitely stay with them again. Highly recommended, beautiful rooms with friendly staff. We were lucky to be upgraded and had a fantastic room and view. The beach on the west side is only a 5/10min walk with lots of cute restaurants and shops on the way! Fab location couldn’t recommended it enough!